Toblerones are a very Christmassy thing, and I got a drone last week. The Tello drone is controllable from Scratch… and Makey Makey. I’ve been looking for a way to combine it with Makey. I bring you Tobledrone – the edible drone controller. A Makey Makey Labz guide is in the works. The points on a #toblerone kinda reminded me of arrows, and I've been looking for a way to hack my drone with @makeymakey. I’ve always felt interactive programmable floor mazes were just too… static. So why not make one you can take with you?! Actually, I just use multiple classrooms, so it was easiest to make a roll-up portable version that could be moved between rooms when we were working on it. 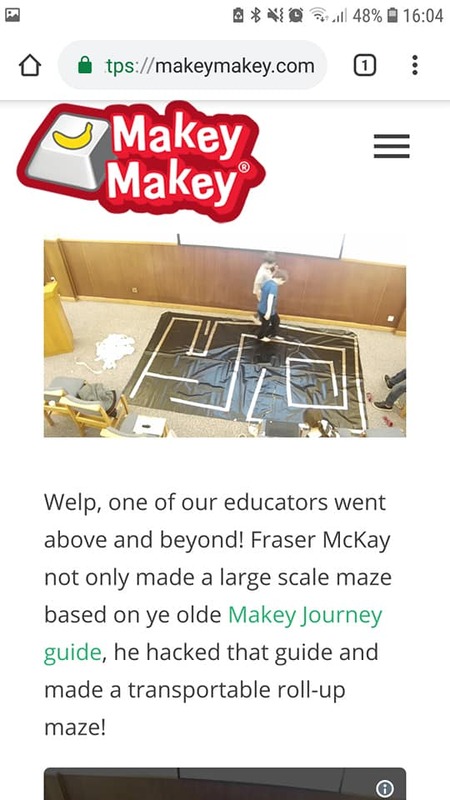 I’m pretty chuffed that my maze remix is featured and has been taken as the #CSEdWeek Hour of Code Challenge Day 3 by Makey Makey – and they made blog post about it. This is a take on the Makey Makey Journey, whereby two people walk along a conductive path – holding hands – to control a computer game. We made our own version with tinfoil tape (becoming one of my favourites) and plastic outdoor sheeting. One path is wired to the Earth terminal, and the other to Space. The connection was a bit ropey at first, but we managed to find where it was dropping off and added some booster wires. We used Scratch to make a circus game with a tightrope-walker and big top music. The featured guide is on Labz and Twitter, and explains it best. This includes a (hopefully funny) video. Making and debugging (tricky!) our roll-up/portable @makeymakey maze. One kid is earth, and the other is space bar. When kids hold hands, they complete the circuit and move a @scratch sprite. Now, I’m away to frame my maze and stick it on a (large) wall in my parents’ house.